All in all a month of strong parkrun performance from 26 Seapark members. Ian Clelland, continued his consistent performance at Carrickfergus parkrun taking first place on 11th July in 18:52 and 3rd place on 25th. Great to see Jonathan Beattie back after injury with a good time of 22:11 on 18th July. Charlie McCormick ran very consistently on his parkruns in July placing 5th twice with times of 20:37 and 20:41. On his one appearance at Carrickfergus parkrun, Richard Hetherington came 4th on 11th of July in a time of 20:39. Bobbie Irvine completed 3 parkruns in total in July, one of these at Carrick and 1 at Antrim where he placed 5th in a time of 19:02 and it was an Irvine family parkrun parade at Hilly Fields parkrun in July with wife Nicola, son Gavin and daughter Emily on taking part! 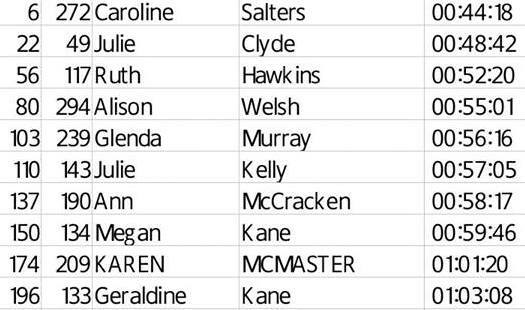 Brendan Rice and his girls are firm favourites at Carrickfergus parkrun and Brendan completed all 4 parkruns at Carrickfergus in July taking 3rd place on 2 of these (11th and 18th). Robert and his wife Glenda Murray both ran at Carrickfergus on 4th July with Robert finishing 3rd in a time of 22:06. 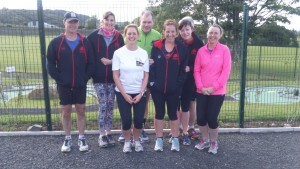 Finally for the first time, Seapark ladies took first place on two occasions at Carrickfergus – Gillian Barnhill, more accustomed to longer distances, was first lady at Carrickfergus parkrun on 5th July in 21:06 and Karen Poag on 18th July in a time of 25:18. 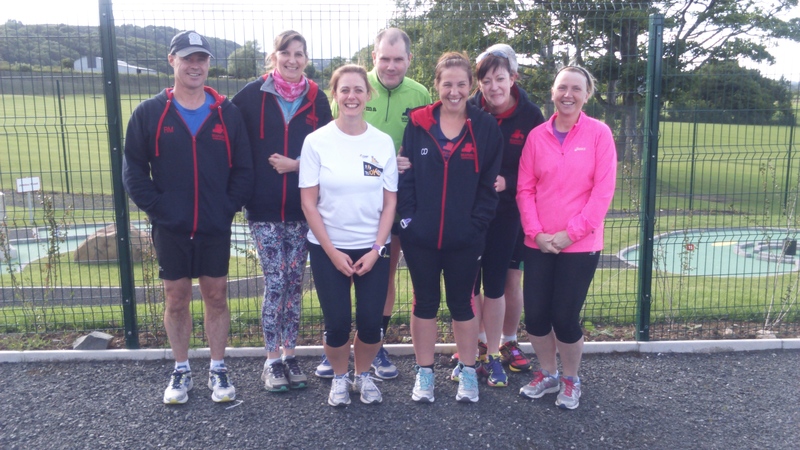 Other members attending Carrickfergus parkrun in June included Allan Grant, Mark Welsh, Gareth Hamill, Phil Poag, Tony Barclay Roisin McConnell, Gary Connolly, Jonathan Brown. Johnathan Bell and Angela McCormick. 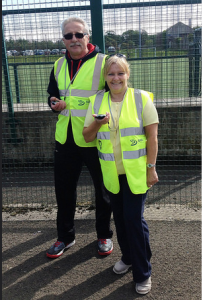 Lots of parkrun tourism going on as well in July to other local parkruns in Antrim for Bobbie Irvine and Robert (21:11 PB) & Glenda Murray. Robert also visited Larne for the beautiful and scenic Carnfunnock parkrun. Trevor Lamb visited Waterworks and also Victoria with Colin McCrumm (21:12 PB) and Karen McMaster took part in the Ormeau parkrun. It was sunny Portrush that was chosen by the Hetherington family for their visit to parkrun on 19th July. Further afield the Irvine four all took part in Hilly Fields, Lewisham with Gavin doing his 56th run at Hull parkrun and Emily finishing 3rd lady on her visit to Carrickfergus. 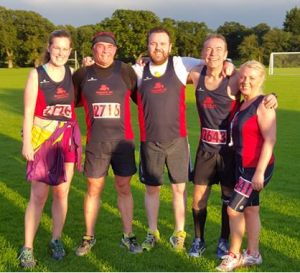 July racing rounded off with Dub Runners inaugural running of their Giants Trail Race from the Dub Playing Fields, Dub Lane, Belfast. Becki, Andy, Phil, Colin and Ann (pictured) enjoyed a challenging 6 mile course on a combination of forest trails, pastures and the Lagan Towpath; before climbing through the woodlands of Minnowburn, passing the sculptures and natural art along the way. Finally passing through the ancient environs of the Neolithic monument at the Giant’s Ring and returning via Edenderry village and Gilchrist Bridge to Shaw’s bridge, finishing at the Dub Playing Fields. 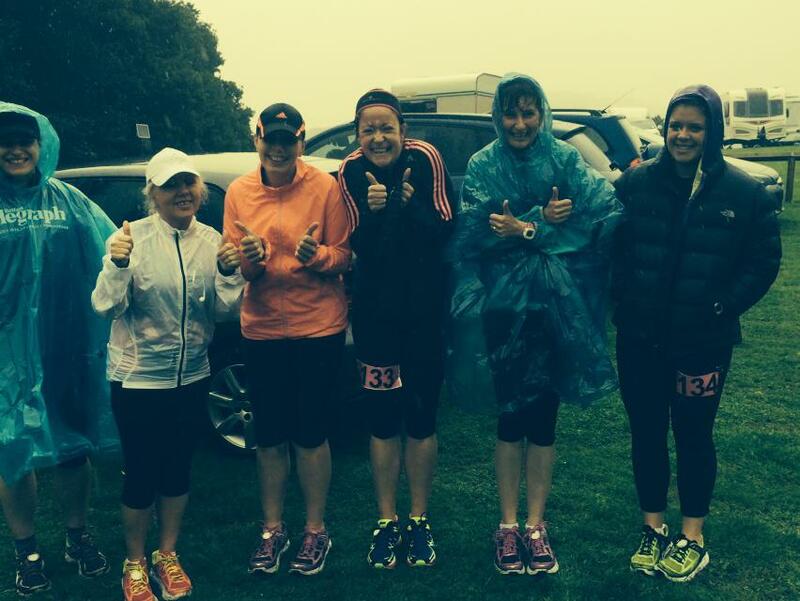 10 ladies from Seapark travelled to Kilbroney to take part in the 26 Extreme Ladies Mini Marathon. The challenging weather conditions didn’t deter the ladies’ enthusiasm and great times achieved all round with Caroline Salters taking 6th place overall with a PB time. 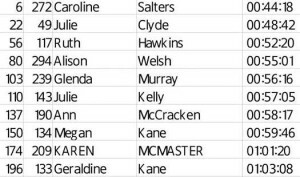 Megan Kane and Karen McMaster also achieved PB’s with their times. 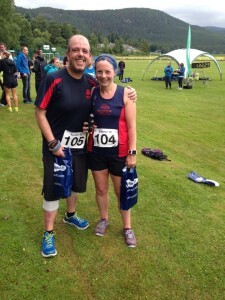 26th July – Ballater 10 mile – Poag holiday race! K aren and Phil taking a break! – at the start of the Ballater 10 mile road race. Ballater is the nearest town to Balmoral Castle. and the course is in the heart of Royal Deeside, an area of outstanding natural beauty. The start / finish is set in beautiful Monaltrie Park. Seapark members took part in the 3rd annual Action on Hearing Loss NI Divis 10k on Sunday. 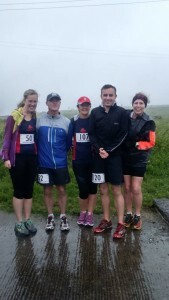 Despite wet and windy conditions more than 100 runners supported the event and enjoyed the post race hospitality. 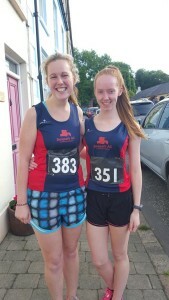 Seapark were represented at the Dalriada 10k by Becki Tester and Jennie Haggan. Both girls produced strong performances on the beautiful 2 loop course which takes in Glenarm Village, Castle and Forest. Karen Poag first home for Seapark at Portaferry 10 mile road race. 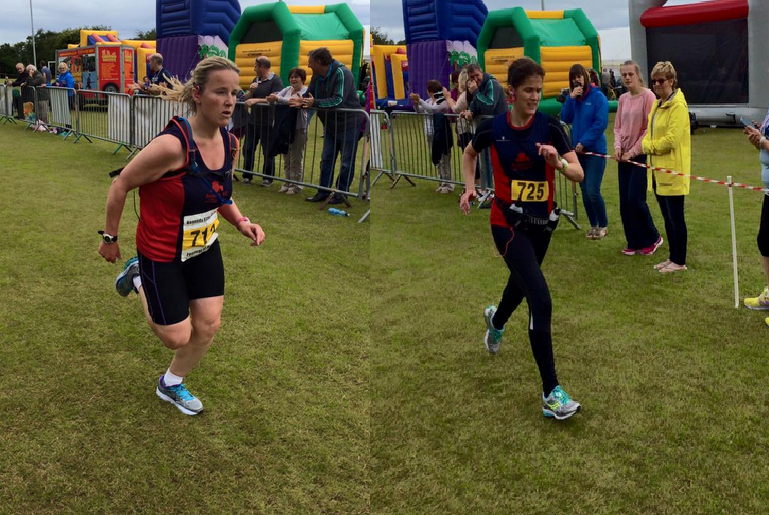 On Friday evening Seapark’s Bobbie Irvine, Gillian Barnhill and Gary Connolly undertook an epic 24 hour endurance event, the Energia 24 hour race held at The Mary Peters Track. This annual event challenges athletes to cover the longest distance in 24 hours. Bobbie Irvine came 14th out of 52 individuals covering a distance of 109.4 miles (440 laps). Gillian Barnhill ran 101.2 miles (407 laps) and was third lady. Gary Connolly ran 77 miles (310 laps). 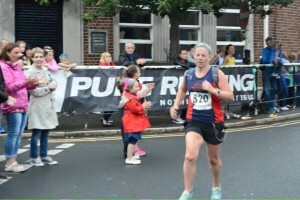 7 out of 7 in the Pure Marathon Series for Gillian Strudwick at Dervock.